Benny’s Legendary Rosemary Fried Chicken | Have YOU Ben Starr Struck? It’s that good, folks. After you taste it, you’ll never want fried chicken from a chicken joint for the rest of your life. You’ll be spoiled to it. But it’s no walk-in-the-park. You can’t whip it together at the last minute. But one taste, and your friends and family will be begging you to make this every week. And the more often you make it, the easier it seems to make. 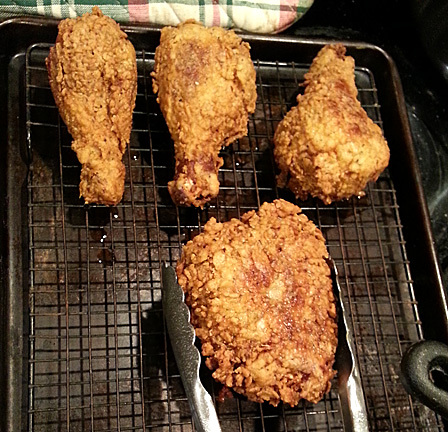 Many of us don’t make fried chicken at home because we’ve had a disastrous experience with it…burnt crust and raw chicken being the most common flub. Trust me, I’ve had those mishaps before, too. But after a few years of tweaking my grandmother’s cast-iron fried chicken recipe, using some ideas from America’s Test Kitchen, and a whole lot of experimentation…this is the end result. We served this chicken with buckwheat acorn waffles and dandelion syrup at FRANK when The Illegal Eater filmed with us last spring, using fresh pastured chicken we harvested ourselves at Grandma’s Farm in McKinney, Texas, and it was a runaway hit. This is the kind of chicken that makes the heavens open when you taste your first bite. And, no…I’m not exaggerating. There are a few secrets that make this chicken so incredible…the first is a rosemary buttermilk brine that infuses the chicken with rosemary and the perfect amount of salty seasoning, and the acids in the buttermilk work to break down the protein in the chicken to make it incredibly tender and moist. The crust is made with a 50/50 mix of flour and cornstarch…an Asian technique that results in an incredibly crispy crust. Blatantly stealing a technique from America’s Test Kitchen, I include baking powder in the crust, as well, and dampen the crust with some of the buttermilk brine to create crumbs that stick well to the chicken and react with both the buttermilk’s acid and the fry oil’s heat to expand the crumbs, giving them a light, airy texture that shatters in your mouth. Fried chicken simply should never taste this good. This recipe is also intended for use in a cast iron skillet…preferably an extra-deep chicken fryer skillet. (I use my regular cast iron skillets to fry chicken, as well, and they are just fine…I only recently got my chicken fryer thanks to Neighbor Sharon.) You cannot do this type of shallow fry in any other pan (unless it is massive and heavy), because lighter skillets have really bad hot spots and you end up scorching the oil and burning the crust. Cast iron is my preferring type of cooking pan (read why here), it’s cheap, you can often find it used at thrift stores and garage sales, but even brand new it costs a fraction of those fancy clad pans with copper cores. So if you don’t have cast iron yet, go hunt for it before you make this recipe. Otherwise, you’ll need an actual deep fryer, which means LOTS more oil. There are a few tricks for exceptional fried chicken that I deliberately avoid, namely the age-old method of frying in shortening, or “Crisco.” While our grandmothers ALL did this, and it does, in fact, result in a superior product…I don’t know what shortening IS. All I know is that it is modified at the molecular level to turn ordinary vegetable oil into a solid, which involves the process of hydrogenation, and results in those nasty trans-fatty acids that food scientists won’t go near. (Modern manufacturers tell us their shortenings are now trans-fat-free, meaning the oils are FULLY hydrogenated rather than PARTIALLY hydrogenated…still, I don’t want to eat anything hydrogenated, I’ll stick to oil,thanks!) I’ve found that canola oil, which has a high smoke point and is a heart-healthy oil, works absolutely fine. Though you’ll need to buy a LOT of it to fry chicken. But more on that later…let’s get to the recipe. Well, I have to stop here to explain. If you’re breaking down a whole fryer, cut away the drumsticks and thighs, and then cut off the breasts and divide each breast into two pieces, so that you have chicken pieces that are more or less of the same mass. The benefit of using a whole chicken is that you then have a carcass for making stock. But it also means that you have to choke down chicken breast, which is the single worst type of meat on the market today. Promise me that, henceforth, you will NEVER buy boneless, skinless breast again. It’s dry, tasteless, and I have no idea why it’s so popular (and expensive) in this country, other than its low fat content. (Though pork tenderloin is even more lean and much more flavorful. But let’s all remember that eating saturated fat doesn’t make you fat. Yes, it clogs your arteries and raises your bad cholesterol…but if you’re worried about losing weight, excess sugar and simple carbs are to blame…NOT fat.) You’re about to eat FRIED CHICKEN, folks, so step away from the boneless, skinless breast, and buy a package of drumsticks and a package of thighs (bone in, skin on, of course). This is what I normally do to save time on this recipe. 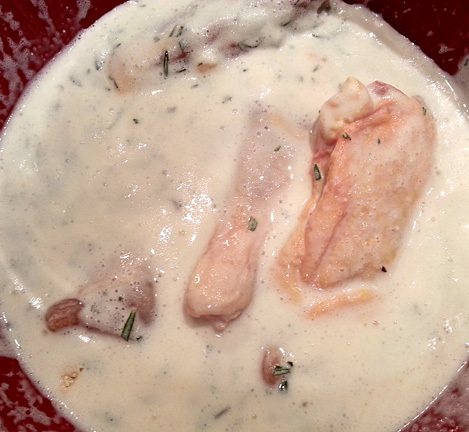 If you’re only frying 1 chicken, you might get away with 2 cups of brine, so halve the recipe. 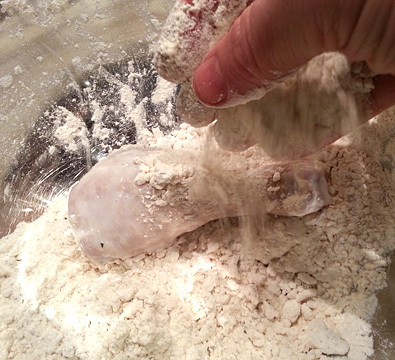 If you’re doing tons, the ratio is 1 Tablespoon kosher salt to 1 cup buttermilk to give the right salinity level. Adjust to however much brine you need. Whisk the ingredients together briskly for about 3 minutes to ensure the salt gets dissolved. Then submerge the chicken parts in the brine, or put it all in a big ziploc bag, making sure the chicken is thoroughly coated in brine, and place it in the fridge for a bare minimum of 4 hours, or up to 8 hours. (I’ve gone as far as 12, but the chicken is pretty salty when you let it go that long.) Everyone once in awhile, give the bowl a jiggle or the bag a squish, to redistribute the brine. If you put the chicken in a bag, it should then be put into a bowl in case the seal on the bag breaks…you don’t want salty buttermilk all over your fridge! 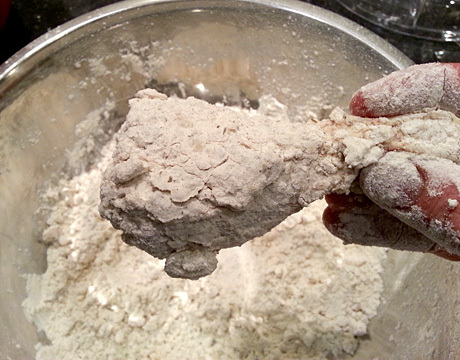 If you use your left hand to transfer the wet chicken pieces to the crumbs, and use your right hand to sprinkle and press, you’ll avoid the nasty building of crumbs on your hands. Shake off any excess crumbs, then place the chicken piece onto your countertop. (I line mine with parchment or plastic wrap first to make cleanup easier.) Repeat until all the chicken parts are done. Let them sit on the countertop while you heat up your oil…you want them to go into the oil at about room temperature, which would be a dangerous move if you weren’t cooking the chicken fully…but we’re going to cook our chicken fully. Heat the oil over medium to medium-high heat to 375F. Then place the chicken parts very carefully into the hot oil. You’ll probably only be able to fry 3-4 pieces at a time. 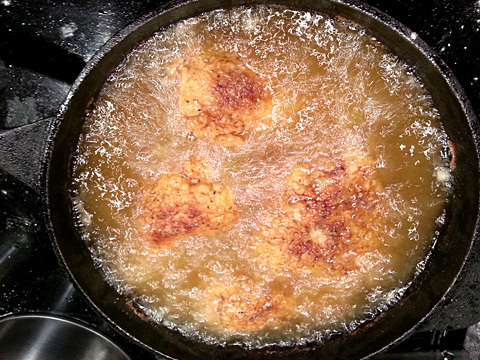 Don’t crowd the skillet, and be sure you don’t add so much chicken that the hot oil overflows! (FIRE!!!) Set the timer for 7 minutes, cover the skillet with the lid or aluminum foil, and leave the thermometer in the oil. The temperature will plummet a bit as the chicken absorbs the heat. It may go down as far as 275F…if it goes down that far, raise the heat a little. You want to aim for a continuous temperature of 325F. That’s your sweet spot. After about 3 minutes, remove the lid, shift the pieces of chicken around in the pot to keep them from burning at any hot spots, and re-cover. After a total of 7 minutes, remove the lid, flip the chicken pieces, and fry uncovered for another 7 minutes (for bone-in pieces, 5-6 minutes for boneless, skinless breast, which you’re NOT using, right?). If I’m cooking for a crowd, I get 2 skillets going so everything goes faster, because you’re looking at about 15 minutes per fry batch. So if I’m cooking 16 thighs (which serves 8 people), that’s a full hour of frying in a single skillet. Serve this up with garlic mashed potatoes, buttermilk gravy, turnip greens with bacon and apple cider vinegar, and fresh buttermilk biscuits, and you’ve got a meal that will send everyone to heaven and back. All thanks to the amazing power of buttermilk! Feel free to comment below, and subscribe to my blog near the upper right corner of your screen so you don’t miss any great recipes! This entry was posted in Main Courses, Recipes and tagged cast iron, Dallas, Frank, Illegal Eater, underground restaurant. Bookmark the permalink. We tend to get quarters, and since I don’t like it the way my folks make it, I do pieces one at a time. Does any of the recipe need to be changed for just a single piece? 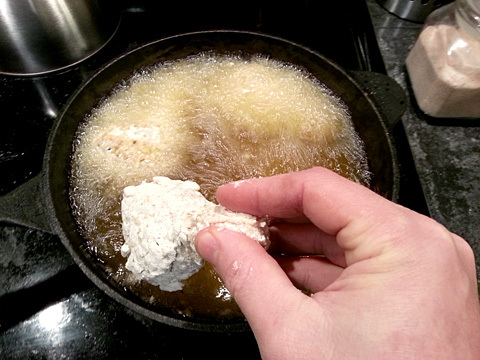 Sumy, if you’re only making 1 piece of fried chicken, you’ll only need 1 cup of brine (plus 1 Tablespoon kosher salt and 1 Tablespoon rosemary), and probably half a cup of breading (1/4 cup flour, 1/4 cup cornstarch, pinch of baking powder, and seasonings to taste). Great! I now have all the ingredients, but I’m in a tossup over the pan. I have a deep stainless steel skillet that’s about 11 inches wide and 3 deep, with an uneven bottom. Otherwise, my largest cast iron is 9.5 across and 1.5 deep. Do I need another pan? Sumy, 9.5″ diameter cast iron is pretty small, and I’m concerned that your stainless skillet isn’t heavy enough…and pretty concerned about the uneven bottom. Sounds like a thrift store tour is in your near future to collect and rehabilitate some cast iron! Or drop by Bass Pro Shop in Grapevine, they have virtually every size of skillet, preseasoned and ready to go! Cross your fingers! I soaked and breaded my quarter as indicated yesterday, but could not cook it. I bagged it, and stored it, and now I’ll be having it tonight, cooked in the oven. I’ll let you know if I’m still alive tomorrow, haha! This recipe sounds better than my mother’s! I always use her cast iron skillet and make large quantities. I do use Crisco, just like she did whenever she was out of lard. BTW, when I was growing up in Fresno, lard was always available at the market. Now we have to go to either a Mexican or Armenian market to get it. Isn’t that odd? My question to you is what type of thermometer should I get to use in the oil? I have only meat thermometers and a candy thermometer. My mother taught me that when you drop things into the oil to see if it is ready, you know by the way that it bubbles up. So that has been my method. It somehow works because we have yet to have underdone chicken, but I know I should use a thermometer rather than take the chance. Cathy, use your candy thermometer for the fry oil. Meat thermometers rarely go above 200F. You can use your meat thermometer to check the temperature of the meat, if your concerned, but if your fry oil stays around 325F for the majority of the fry, your meat will be safe! That looks mouthwatering. I have to try this recipe and soon. Thanks Ben! That’s very much the traditional way of frying chicken, and your chicken will be even more delicious…albeit a smidge higher in saturated fat! *chuckle* Don’t worry about replacing a “whole fryer,” just cook as much chicken as you need to serve. Usually 2 pieces per person. 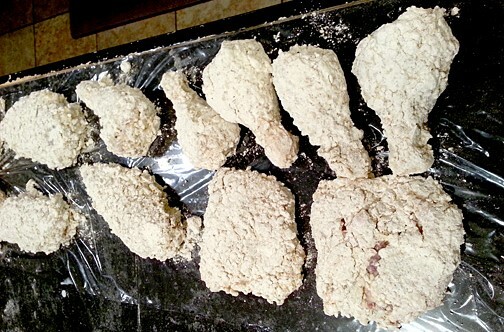 The quantities I’ve specified in the recipe in terms of brine and breading should cover about 8 pieces of chicken. (More with drumsticks, less with large thighs.) But it’s easy and quick to make up a little extra brine or breading. If the chicken in your fridge is a larger one, save it for the roasting pan! 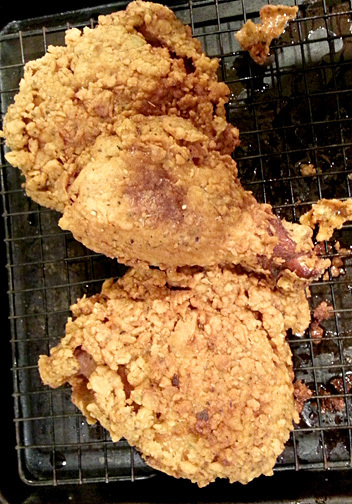 Younger, smaller birds make better fried chicken. Huge thighs like from a roaster may not cook all the way through properly.